This app is coming soon. Please check back for updates. If you are a Veteran enrolled in VA health care, the Summary of Care App lets you receive and view your VA medical information in one place and from the convenience of your mobile device. The Summary of Care App allows Veterans to view specific parts of their VA electronic health record on a mobile device in table form as well as in graph form. VA Electronic Health Record data available in this app includes Patient Contact Information, Medical Diagnoses, Allergies, Medications, Surgeries, Lab Results, Vital Signs, Radiology Exams, Consults and Future Appointments. Demonstration providing introduction to the Summary of Care mobile application for Veterans. The Summary tab is your default screen and will show you an overview of the information in your VA Electronic Health Record (EHR). Tap the categories in the Sections window to jump to that information in your Summary. You can also scroll through the Summary window to read through all the categories of information. From the Summary tab screen, tap the Menu button with a three-line icon in the upper left corner of your screen. The Menu button will always be available in the upper left corner of your screen. Tap the Menu button, and a slide-out Menu screen of the features and capabilities of the App will appear. Tap the X button in the right corner of the Menu screen to exit. You can view the history of your vital signs information either as a table or graph. The table option shows you a chart of all of your vital sign readings over time. The graphical option will graph readings of a selected vital sign over a designated period of time. Tap the Graphical tab in the Vital Signs window, and select which vital sign you would like to see. To change the date ranges for data, select from the choices at the top of the Graph of Vital Signs window. Although a list of medications is included in your Summary, the Medications screen (accessible from the Menu) provides more details about each medication. Adjust the filters in the Medications window to define your search by Status, Date Range, or Number of Medications. You can view your lab results as either a table or a graph. Select Table to view a complete list of all lab results by date. Tap a time frame or customize one and you will see details of the medications in the designated time frame in the Table of Lab Results window. You can view your lab results as either a table or a graph. Tap Graph to reveal a list of lab result groupings. 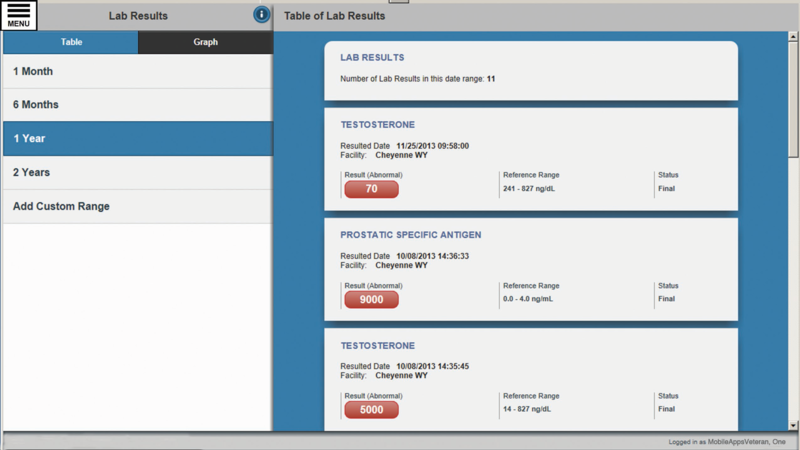 Select a lab test to view, and the results will be graphed in the Graph of Lab Results window. The time frame will default to two years, but you can change it to 1 Month, 6 Months, or 1 Year or customize the date range up to six years. You can sort your radiology results alphabetically or by date. Tap the report you would like to view, and the details will display in the Radiology Results window. When you’ve requested a consult with your VA care team members, you can check the details and status of your requests to see if they are pending, active, scheduled, discontinued or canceled. Why should I use the Summary of Care App? If you are a Veteran enrolled in VA health care, the Summary of Care App helps you quickly access data from your VA Electronic Health Record (EHR) from the convenience of your mobile device. This app can help you better understand your health, reference information about your health history and treatment plans and actively monitor your health and track progress over time. What do I need to do to set up and log into the Summary of Care App? To use the Summary of Care App you must be enrolled in VA health care and have a DS Logon Level 2 (Premium) Account. When you log into the Summary of Care App using your DS Logon Level 2 (Premium) Account credentials you must read the End User License Agreement (“EULA”) and Notice of Privacy Practices (“Notice”). Tap Accept to use the Summary of Care App, and you will proceed into the app). NOTE: If this is your first time using a VA app that requires a DS Logon Level 2 (Premium) Account, you may have to provide your Right of Access as part of the log in process. The app will prompt you if this is necessary. If it is necessary, you will be taken to a Right of Access screen. Read the Request for Access to Your Health Information. If you would like to continue, tap Next. You will go to a Review screen. Read VA Form 10-5345a. If you agree, tap Verify to “sign” the form, and you will proceed into the app." What kind of information can you view on the Summary of Care App? The Summary of Care App shows you a summary of your contact information, medical diagnoses, medications, allergies, surgeries and upcoming appointments. The app also provides detailed information about your vital signs, medications, lab results, radiology reports and consults. Where can I see the categories of information (e.g., Allergies, Surgeries) covered in the Summary of Care App? When you first log into the app, the screen defaults to your Summary screen. You can always revisit this screen by tapping the Menu button with a three-line icon in the upper left corner of the screen and selecting Summary from the slide-out Menu that appears. The Sections window will appear on the left, and the Summary window will appear on the right. The Sections window on the left shows you the categories of information covered in your summary. The Sections include Contact Information, Medical Diagnoses, Medications, Allergies, Surgeries and Upcoming Appointments. (For more detailed information about medications, view the Medications screen, which can be found by tapping the Menu button with a three-line icon in the upper left corner of your screen.) 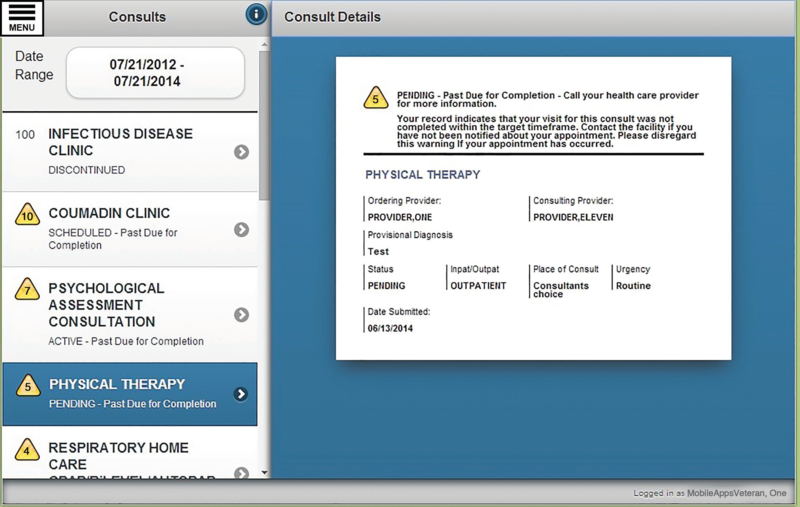 The Summary window (right side of screen) shows the details of the categories from your medical record. Scroll down to see all of the information in the record. To jump to a category of information covered in your Summary, tap the category you wish to view in the Sections window (left side of the screen), which will bring the section into view in the Summary window. How can I view my vital signs? Tap the Menu button with a three-line icon in the upper left corner of your screen. A slide-out Menu will appear. Tap the Vital Signs tab. Choose whether you would like to view your vital signs as a table or a graph. The table option shows all of your vital sign readings over time. The graphical option will graph readings for a selected vital sign over time. If you choose to view the data as a graph, you must select which type of vital sign you wish to see. The graph of the vital sign will appear in the Graph of Vital Signs window (right side of screen). What information can I see about my vital signs? The vital signs tab shows your Blood Pressure (BP), Pulse, Respiration, Temperature, Weight, Pain and Pulse Ox. How can I view my medication history? Although an overview of your medications is included in the Summary tab, the Medications screen provides more details. To view this information, tap the Menu button with a three-line icon in the upper left corner of your screen. A slide-out Menu will appear. Tap the Medications tab. Date Range or Number of Medications you would like to view. Based on your selections, the resulting list of medications will display in the Medications List window (right side of screen). Tap the Reset button to return to the default values for the Filters. What information can I see about my medications? The Medications tab includes a list of both your active and expired medications. For each medication, you will see the Rx number, medication name, status (active or expired), instructions for taking the medication, quantity prescribed, number of refills remaining, date of last refill, date of initial order and the facility where your medication was prescribed. Tap the Menu button with a three-line icon in the upper left corner of your screen. A slide-out Menu will appear. 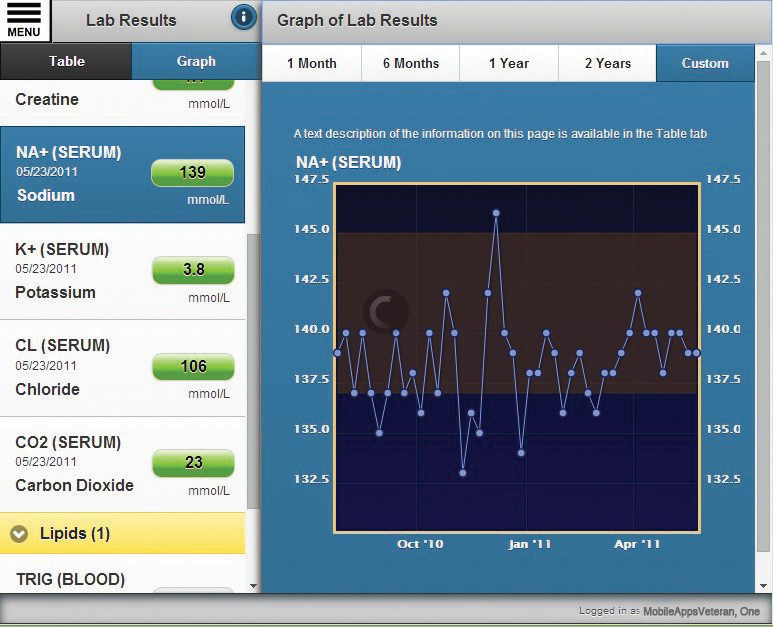 Tap the Vital Signs tab, and you can choose whether to view your lab results as either a table or graph. Both the table and graph options allow you to choose or customize a date range. For tables, you must select the date range first to view all the lab results. For graphs, you must select a specific lab result first, and then you can choose from the date range options from the tabs at the top of the graph. In either table or graph views, the Add Custom Range tab opens a pop-up window to specify a date range. What information can I see about my lab results? If you view your lab results as a table, you can see the date your care team finalized the analysis of your results, facility you had your lab taken, results of the lab, reference range (the “normal” range) and status of the lab in processing. If you view your lab results as a graph, you can see how your lab results have changed over time. 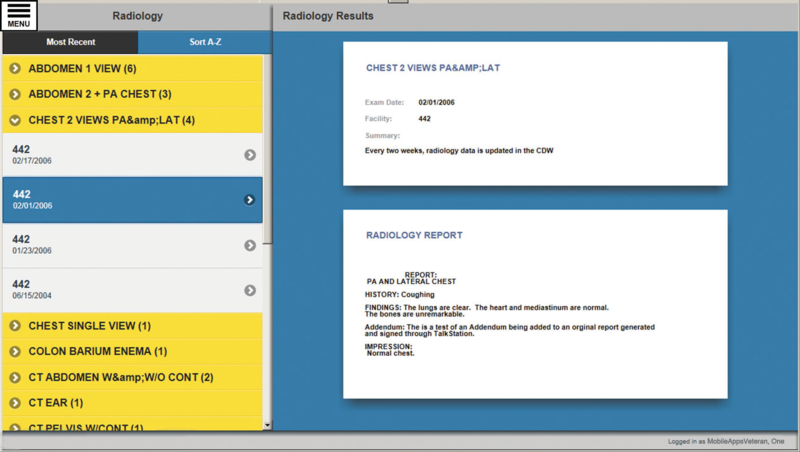 How can I view radiology reports? Tap the Menu button with a three-line icon in the upper left corner of your screen. A slide-out Menu will appear. Tap the Radiology tab. The header on the left side of the screen will change to Radiology, and you will be able to sort your results alphabetically or by date. Tap the report you would like to view, and the selected choice will appear in the Radiology Results window (right side of the screen). What information can I see about my radiology reports? The Radiology Reports tab shows you the exam date, the facility where the exam occurred, the summary for the exam, and the report for the exam which includes the result and overall impression of what the exam shows. How can I view the status of my consults? Tap the Menu button with a three-line icon in the upper left corner of your screen. A slide-out Menu will appear. Tap the Consults tab. The header on the left side of the screen will change to Consults, and a list of consults and their status will appear below. Tap a consult, and the details will appear in the Consult Details window (right side of screen). You can change the date range of your consults to broaden or narrow the information. What information can I see about my consults? When you tap a consult to view its details, you will see information about the type of consult, ordering provider, consulting provider, provider diagnosis, status, inpatient versus outpatient, place of consult, level of urgency and the date a request was submitted. The number next to each consult represents the number of days since the consult was created. Most consults will progress from pending, active, scheduled to discontinued or canceled. If a consult has not been moved to the next status within the expected time, the number will be highlighted with a yellow triangle icon. Part of the Summary of Care screen is not visible. How can I see the information? The Summary of Care App's screen is divided into two parts. 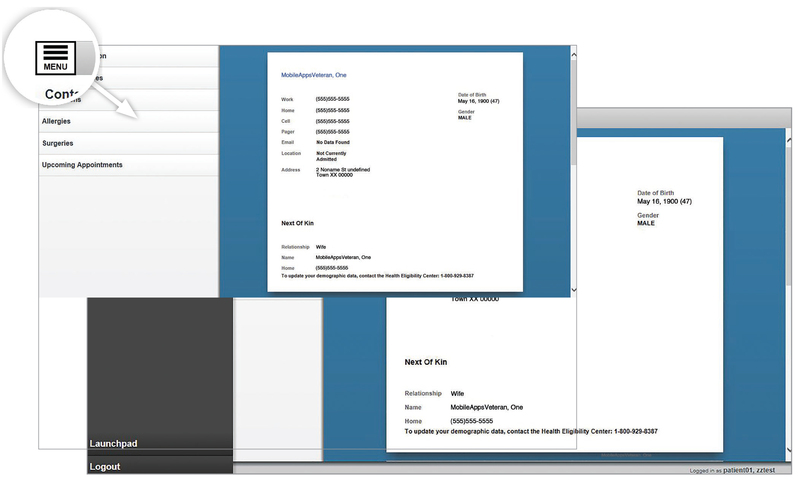 The left side of the screen is the Sections window, which provides a menu of information you can view. The right side of the screen contains the Summary window, which shows you the information from the selected section. If you're using the app on your personal computer with a full size screen, both sides of the screen will be visible. If you're using the Summary of Care App on a mobile device (e.g., iPad, iPhone, Android device, etc. ), you will need to switch between the Sections window (left side of screen) and the Summary window (right side of screen) to view the medical information. To switch between the two windows, tap the button with the dashes in the circle. Different sized screens will display differently; on some devices both sides will show if the device is held horizontally. DS Logon (Department of Defense Self-Service Logon) is a secure logon ID, created by the Department of Defense (DoD), that verifies the identities of individuals affiliated with DoD or VA and allows them to access secure websites and digital resources across DoD and VA using a single username and password. You will need a DS Logon Level 2 (Premium) Account to use the Summary of Care App. If you do not have a DS Logon Level 2 (Premium) Account or are not sure, visit mobile.va.gov/dslogon or dial 1-800-983-0937 for assistance.